A zero-day vulnerability has been discovered and reported in the Microsoft’s Windows operating system that, under a certain scenario, could allow a remote attacker to execute arbitrary code on Windows machine. Discovered by security researcher John Page (@hyp3rlinx), the vulnerability was reported to the Microsoft security team through Trend Micro’s Zero Day Initiative (ZDI) Program over 6 months ago, which the tech giant has refused to patch, at least for now. 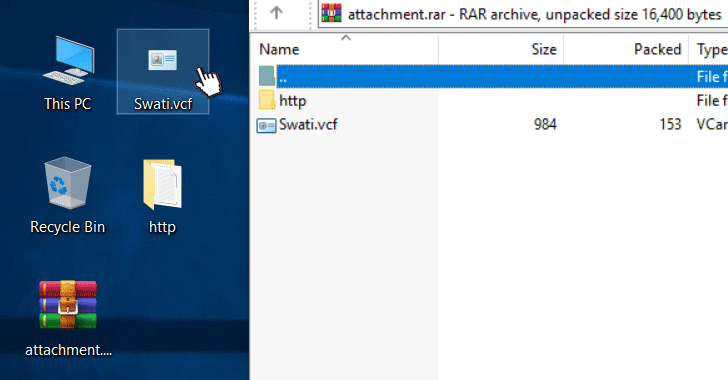 According to the researcher, a remote attacker can maliciously craft a VCard file in a way that the contact’s website URL stored within the file points to a local executable file, which can be sent within a zipped file via an email or delivered separately via drive-by-download techniques. Although the attack requires user’s interaction, leaving the vulnerability unpatched would leave an opportunity for sophisticated attackers to target Windows users at large. Previous article Does WhatsApp Have A Privacy Bug That Could Expose Your Messages?